On a business trip to Mexico, mild-mannered Harold Soyinka (David Oyelowo) finds himself at the mercy of his cutthroat bosses Richard (Joel Edgerton) and Elaine (Charlize Theron), local drug lords and a morally conflicted black-ops mercenary. Crossing the line from law-abiding citizen to wanted criminal, Harold battles to survive his increasingly dangerous situation. 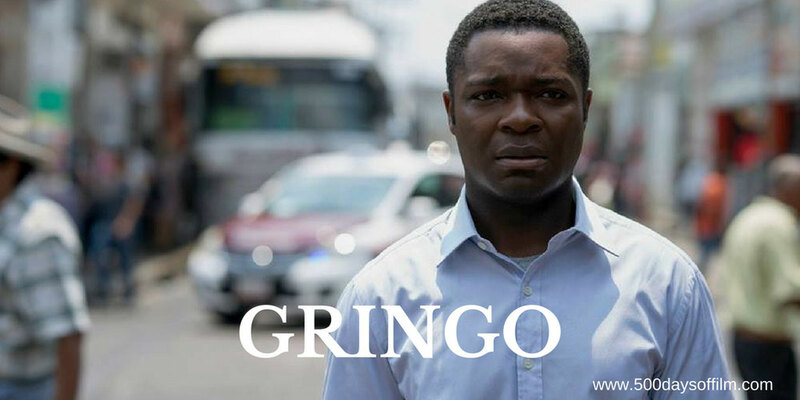 Despite a charming performance from David Oyelowo and a fiesty turn from Charlize Theron, director Nate Edgerton’s Gringo is a rather unpleasant and unrewarding slog. I felt every one of the film’s 111 minutes and, at the end, wondered why I had chosen to spend time with Gringo's obnoxious and mean-spirited characters. Gringo feels like an opportunity wated - particularly as the film's trailer hinted at a funny crime romp. A funny fish out of water tale with an impressive cast (including Nate’s brother Joel, Thandie Newton, Amanda Seyfried and Sharlto Copley). However, despite an admirable effort from Oyelowo, the laughs are few and far between as the film lumbers from one derivative set piece to another. The ingredients were certainly there for an entertaining caper but, sadly, someone forgot the recipe. If you have, what did you think of Nate Edgerton’s film? Let me know in the comments section below or let’s chat over on Facebook or Twitter (@500DaysOfFilm).